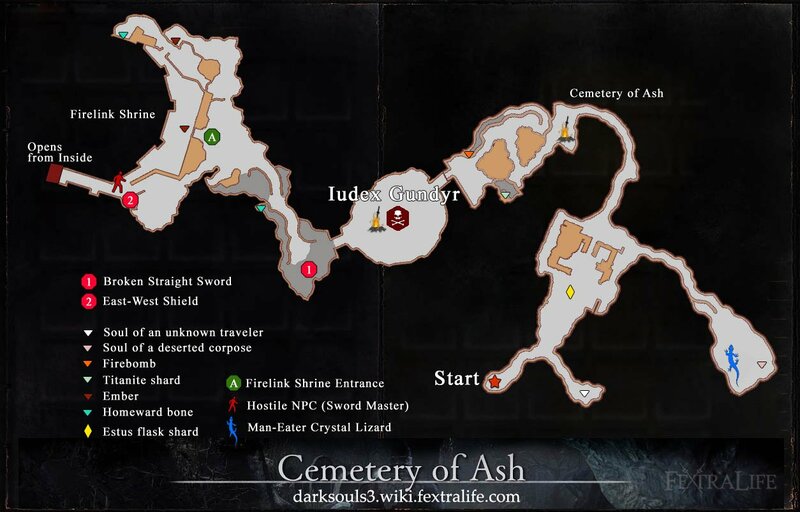 The Cemetery of Ash is designed in such a way that the player is occasionally offered the choice to go right, but whenever they do so, they are met with negative outcomes. The very first fork that the player encounters leads to a dead end with a low-value soul item, which is worthless since the player cannot use souls for anything yet. Although this is not terribly punishing, it sets an implicit connection in the player’s mind which associates going right with bad outcomes. The player doesn’t realize this: it is far too subtle, it has only happened once, and the outcome wasn’t too bad. Even though this hasn’t registered consciously, it has planted a small seed. The next time the player is given the opportunity to turn right is through the flooded path after the ashen estus flask. Here, the path is much more explicit, with a message telling the player to turn back. At this point, the player has still not fully developed a fear of going right, so the game uses this path to drive home that point by pitting the player against a powerful crystal lizard which will almost certainly kill them. Even if the player manages to win, through some miracle or if they have previous experience, they will get a titanite scale which they will not be able to use for a long time. But in the more likely scenario that they die, this evokes a sense of surprise rather than despair. At this point, the penalty for death is not severe, so the player shrugs and says “well, that’s Dark Souls for you” and moves on. 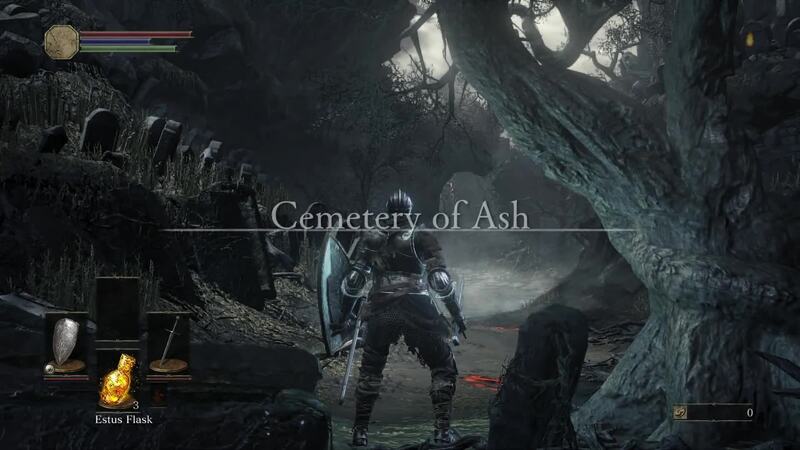 If the player progresses straight ahead from the ashen estus flask rather than going right to the flooded path, they will encounter a path which turns left towards a bonfire. There is no choice to go right (except to fall off a cliff), but this further reinforces the belief that right is bad and left is good. Every time the player has gone right, something bad has happened to them. On the other hand, every time they have gone left, they have experienced progress and treasure. These associations are still not part of the player’s conscious decision making process, but they are growing stronger. The player may pause the next time they are given the opportunity to go right, even though they might not actually know why. Right after the bonfire, the player encounters a fairly open area with several different paths: the rightmost path requires the player to drop a short distance on top of an enemy, the center/slight right path has two sleeping hollows, and the straight ahead/left path has a single active hollow who will run and attack as the player approaches. The player will naturally have to deal with this threat. The whole setup implicitly drives the player to the leftmost path. First, the player doesn’t want to take falling damage from the rightmost path. Second, the player doesn’t want to wake up the two sleeping hollows in the center path. Third and most importantly, they have already “committed” to going left by killing the enemy, so they might as well go down the cleared path. Soulsian level design often uses this “sunk cost” effect to push players in the intended direction. With the dead end and the crystal lizard, the player was punished for going right. Now, at the bonfire junction, the player decides not to go right. This is a significant psychological shift that marks the player’s internalization of an arbitrary rule. They are expecting a punishment for going right even before they are actually punished. In this way, the association between turning right and experiencing punishment has cemented itself in the player’s subconsciousness. But as the player goes left, the pattern starts to shift in the opposite direction. The game tells the player to jump for a titanite shard, but once the player picks it up, they realize that they cannot turn back. They fell down a short drop, preventing them from backtracking for the first time in the level. This puts them in a frame of mind to be panicked, afraid, and uncertain. In this state, they will naturally default to the most comfortable option, which is to turn left, which takes them to Gundyr. Normally, one would think that the player would turn right in order to get back to the bonfire, but the game flips this on its head through subliminal level design. There’s even another use of the sunk cost effect as the player fights a crossbow hollow right outside the boss arena, further pushing them towards Gundyr. The game implicitly supports this by offering opportunities for plunging attacks. Players first learned about plunging attacks on the leftward path through an explicit message. When they die to Gundyr and return to the bonfire, they find that the rightmost path leading off a cliff has a vulnerable hollow leaning against the wall. 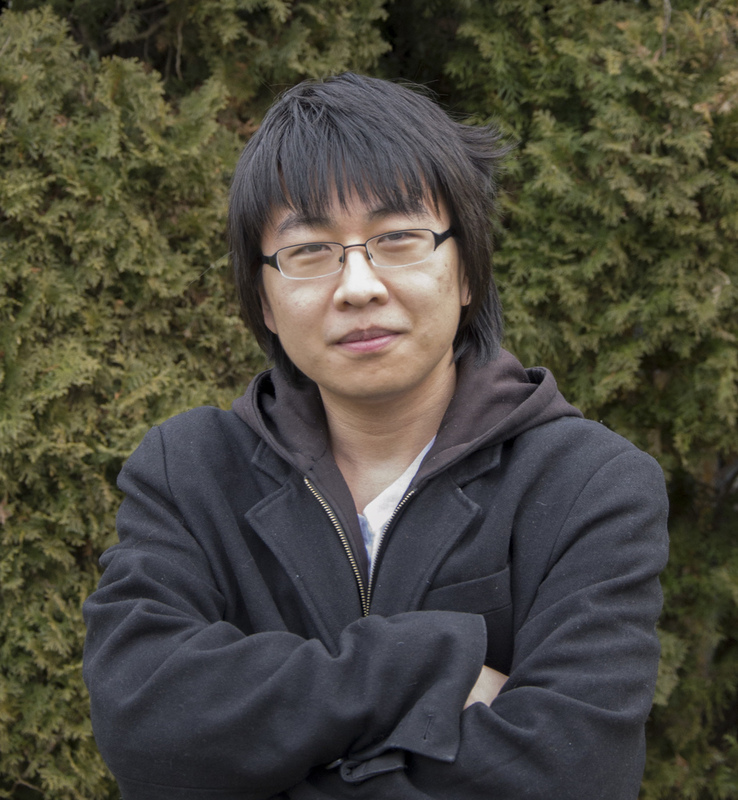 Even though the player would not have gone that way the first time, they feel empowered to try it again now that they know about plunging attacks. Armed with this knowledge, the player fights through the rightmost path, battling against several difficult encounters, and finds the firebombs. These are especially effective against Gundyr’s second form, which the player wouldn’t have experienced before dying several times. And yet, they wouldn’t have found the willpower to go right if they hadn’t died several times. The level design implicitly encourages players to go through a linear sequence from leftmost path, then to Gundyr, then to rightmost path, then finally back to Gundyr. When the player returns and defeats Gundyr using the firebombs, they feel a sense of pride for overcoming a great challenge. But it is not simply the fact that they have defeated a very difficult enemy. It is also the climax of a subliminal story arc that the player didn’t even know they were starring in. The level design makes the victory feel that much sweeter. To describe it more dramatically, the player defeats Gundyr by overcoming their fear of going right. In any other context, it would seem like a ridiculous thing to fear, but this is not a conscious fear. It is an implicit pattern which the player does not even realize, and yet it is guiding their emotional arc through the level. Going right has created so many different feelings: disappointment (weary soul), bafflement (crystal lizard), uneasy tension (leftmost cliff face), despair (Gundyr), resolve (rightmost path), and finally renewed vigor (firebombs). As the player opens the door outside Gundyr’s arena leading to Firelink Shrine, the path slopes gently upwards and to the right. But the player is no longer afraid to go right. This is a resolution to the “right path narrative” which lets the player bask in their newfound fearlessness. The path to Firelink Shrine is a victory lap celebrating not only the skills the player has mastered in order to reach this point, but also their mental fortitude to face their fears and come out stronger.